Whisky is a fickle, capricious tipple. Just when you think you’ve got a handle on it, it goes and throws you a curveball. 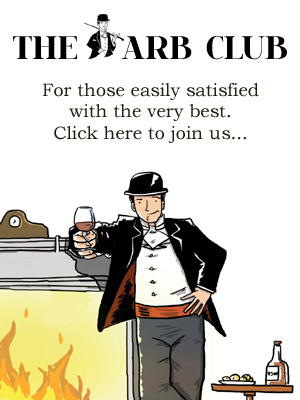 We know it well at The Arb (Stirling is a standard bearer when it comes to fine scotch – or maybe he just corners the market in tasting invitations) but the Caledonian’s cousin over the pond – the one spelled with an ‘e’ – is even more elusive. It’s not just malted barley, but there are ryes, corns and whiskeys of many grains to be had, and made in ways as diverse as the places they come from. So, what do we know of bourbon? Surprisingly little, it turns out, as I learned one evening with our hosts, craft distillers, Hudson. Hudson, you say? As in the Hudson? Indeed. It turns out Bourbon is not the sole preserve of the southern states. A small distillers, in the delightfully-named Tuthilltown, Gristmill, in upstate New York, have been making whiskies – and making them damn well – for a little over ten years. And they have several firsts they’ve notched up. Theirs is bourbon unlike any other. Not by virtue of its standard, but what it’s made from; their ‘baby’ bourbon is 100% corn, and aged in oak. To the uninitiated, that might not sound odd, but consider what constitutes most bourbons and you get a sense of where Hudson’s are not only inventive, but quite unique. Traditionally, to make a bourbon, one need only use about 50% corn, then only stored in burned American oak barrels and for no determined period of time. Oh, and it has to be American, naturally. In short, that means an adulterated mash tun, un-aged, in new oak. Hudson’s, however, is crafted. It’s singular grain. It’s barrel aged. The result is a lovely smokey, smooth, honeyed drop, bearing hallmarks and nuances of many of fine scotch. Nearly all of Hudson’s output can be attributed to experimentation, craft and happy accident. In fact, the distillery itself came about by chance. The chaps that founded it in 2001 had originally bought the Tuthilltown Gristmill to set up a rock climbing ranch. But disrupting 240 years of milling history made them rethink. They had a granary, a water source, and access to local grain. A change of plan, two years of research, learning, crafting and the first batch was tasted out of the barrel in 2003. Not long after, and a little honing, came their first award. Their set-up wouldn’t be the only experimentation Hudson’s distillers have played with either. They had a request once, a short hop away in Vermont, from a maple syrup producer who was short of barrels. Hudson sent some of their whiskey barrels over to assist. Once decanted, the barrels were returned to Tuthilltown and, out of curiosity, the chaps had a shot at maturing a batch of their rye was in them, post-syrup. The result was their Maple Cast Rye. Needless to say, the normal peppery assiduousness of rye whiskey is beautifully offset by the subtle sweetness of maple syrup. But there’s one thing that marks all of Hudson’s output. All of their whiskies have one thing in common, that sets them apart. The name, Hudson, is not a happy accident, it’s symbolic of its history. For Hudson is the first distillery in New York state since 1933, a date the historians among you will recognise as the end of Prohibition. Now, that’s a real first. Fate? Possibly. A pioneering spirit? Certainly. To learn more about Hudson whiskies and the Tuthilltown distillery, visit www.hudsonwhiskey.com. Hudson whiskies are available from Master of Malt, Selfridges, Waitrose Cellar and other leading stockists. Such is their attention to the craft, on Monday 25th July Hudson pitted some of London’s finest bartenders against each other in a cocktail competition for a coveted place on Hudson’s Bartender Incentive Programme. Winners’ concoctions will be available on the new cocktail menu at The Botanist and other bars in the ETM Group. The Arbuturian has been asked along to assist with the judging. Duty calls.